(Natural News) Breast cancer survivors should be watchful of what they eat, especially when it comes to how their food is prepared. Research has shown that the method of food preparation matters, particularly in meat. A study published in the Journal of the National Cancer Institute revealed that breast cancer survivors who eat high amounts of grilled, barbecued, and smoked meat are more likely to die earlier compared to those who ate lesser amounts. 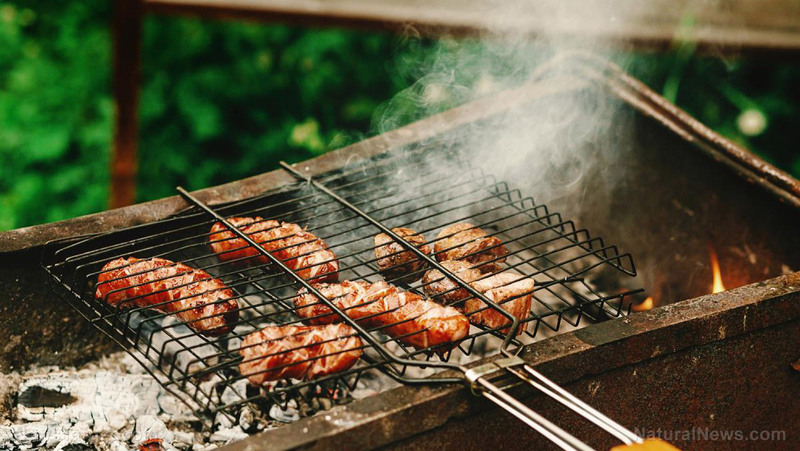 Meat products cooked at high temperatures (grilled, barbecued, and smoked) contain polycyclic aromatic hydrocarbons (PAHs) and other compounds associated with an increased risk of breast cancer. Researchers at the University of North Carolina at Chapel Hill investigated whether the consumption of this source of PAH affects survival in women diagnosed with breast cancer. For the study, the researchers followed 1,508 women diagnosed with breast cancer for an average period of 17.6 years. They conducted interviews and gathered information on the participants’ consumption of grilled, barbecued, and smoked meat. Within this period, 597 deaths were recorded, 237 of which were linked to breast cancer. The researchers discovered that a higher consumption of meats prior to diagnosis of breast cancer was linked to a 23 percent higher risk of dying from any cause. Moreover, consuming more grilled, barbecued, and smoked meats after being diagnosed with breast cancer resulted in a 31 percent increased all-cause mortality rate compared to those who eating less meat cooked at high temperatures. They concluded that eating high amounts of grilled, barbecued, and smoked meat may increase the risk of death among breast cancer survivors. Other studies also found similar results and revealed that there is a greater risk of developing breast cancer among individuals who consume meat cooked at high temperatures. One of these studies was carried out by researchers at the University of Minnesota, and found that women who ate overcooked hamburgers had more than 50 percent increased breast cancer risk compared to those who ate their burgers rare or medium.Meanwhile, the Iowa Women’s Health Study discovered that women who regularly consumed well-done steak, hamburgers, and bacon increased their breast cancer risk by 4.62 times. According to an article published on the website Healthline.com, the best ways to cook meat are slow cooking, pressure cooking, and sous vide – all of which involves cooking meat at low temperatures. In slow cooking, meat is cooked at low temperatures using moist heat. Pressure cooking uses moist heat and pressure to cook food quickly, and sous vide involves immersing meat sealed in a package in a water bath at low temperatures. Cooking with acidic ingredients, such as lemon or vinegar in marinades, can significantly reduce the production of advanced glycation end products (AGEs), which cause tissue-damaging oxidative stress and chronic inflammation. AGEs also negatively affect enzymes, hormones, antibodies, and neurotransmitters, damaging cell DNA and increasing cancer risk. Since meats are naturally high in AGEs, cooking increases the formation of these hazardous chemicals. Therefore, you may want to change your food choices instead. Plant-based foods, including vegetables, whole grains, fruits, and nuts, contain much lower levels of AGEs. Read more news stories and studies on the various causes of cancer by going to CancerCauses.news.